"A detached retina in dogs can result from multiple causes. Treatment is needed as soon as possible to keep photoreceptor cells in the eye from dying. Treatment options include the use of medications, lasers and surgical reattachment. This condition can result in blindness." The retina is the part of the eye that lies against the back. It collects light and then transfers them to the brain where it is interpreted as vision. When the retina becomes detached it stops collecting light and causes blindness. If the condition is not treated immediately and blood supply restored to the retina, the photoreceptors in the eye will start to die. Once this happens the condition cannot be reversed with treatment. Serous detachment: is caused by build up of fluid underneath the retina. The fluid can be blood or other liquid waste from the cells. Traction detachment: is caused by a force which pulls the retina off its base such as inflammation in the eye or the formation of fibrin (the substance that helps blood to clot). Rhematogenous: this condition describes the formation of holes in the retina that are caused by injury or surgery. This in turn causes the detachment. Your veterinarian will perform an eye examination using an ophthalmoscope where they will immediately notice that the retina is not where it is supposed to be. Instead they will see something floating in the back of the eye. An ultrasound of the eye will create an image of the eye which can greatly aide treatment. Treatment options depend on the underlying cause of the problem. In some cases it is possible to reattach the retina, with either medications which dissolve anything that may have caused the detachment such as the buildup of fibrin strands, or the elimination of any infectious diseases. Surgery may be called for in some cases. If the retina can be reattached then vision will be restored. For partial detachments an approach called laser photocoagulation can "weld" the retina in place and seal any holes. 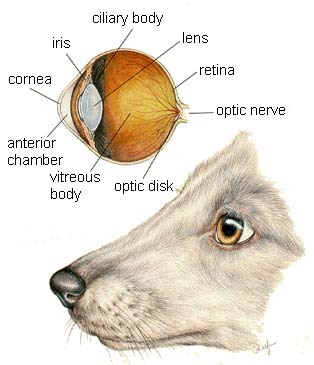 Note: The pictures in this Canine Eye section of pages are reprinted with permission by the copyright owner, Hill's Pet Nutrition, from the Atlas of Veterinary Clinical Anatomy. These illustrations should not be downloaded, printed or copied except for personal, non-commercial use.